Welcome to the IslandWood Garden! 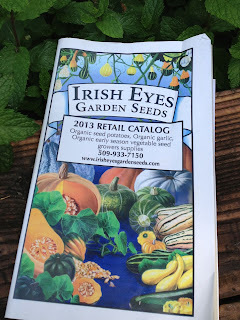 : A bounty of Irish Eyes Seeds! A bounty of Irish Eyes Seeds! The IslandWood garden was recently given a huge gift in the form of seeds! Irish Eyes, a seed company from Ellensburg, WA, donated a box of about 800 packets of seeds. In the box was everything from lettuces to lemon cucumbers, and kohlrabi to kale. We are delighted to grow some of the beautiful heirloom varieties they offer. Thank you Irish Eyes for your generous donation! And to anyone who would like to take a look at their beautiful offerings, here is a link to their webpage: Irish Eyes. They have a lot of good planting information too. And thank you to our awesome summer volunteers, for sorting and organizing the seeds! !